Recently, advanced signal analysis which is called "time-frequency analysis" has been used widely in nondestructive evaluation(NDE) applications. The wavelet transform(WT) is applied to the time-frequency analysis of ultrasonic echo waveform obtained by an ultrasonic pulse-echo technique. The Gabor function is adopted the analyzing wavelet. In this study, the feasibility of noise suppression of ultrasonic flaw signal and NDE of material degradation using wavelet analysis of ultrasonic echo waveform have been verified experimentally. It is well known that NDE techniques are used extensively in industry owing to the versatility and inherent advantages of the method. Degradation and damage of material can be evaluated in two ways: destructively and nondestructively. The destructive method is widely used for the estimation of material degradation, but it has a great difficulty in preparing specimens form in-service industrial facilities. The destructive methods such as impact testing, tension testing, and fracture toughness testing are reliable in the estimation of material degradation due to the prolonged service exposure in high temperature. Therefore, the estimation of material degradation by nondestructive method is strongly desired. 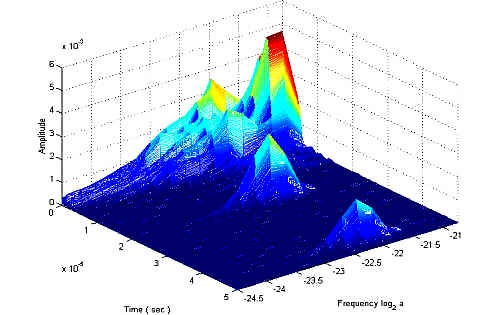 Advanced signal analysis which is called "time-frequency analysis (t-f analysis)" provides a new tool for processing transient signals and it can be considered as an alternative to the classical Short-Time Fourier Transform(STFT) for describing the time-frequency evolution of such signals obtained by an ultrasonic pulse-echo method. The utilization of t-f analysis(wavelet transform) is widespread and an attractive signal processing technique for evaluation of material characterization nondestructively. The WT has already been shown as a useful tool for the interpretation and the enhancement of ultrasonic data in the context of NDE. In more conventional ultrasonic nondestructive evaluation(UNDE) work, it clear that the uses of frequency domain and time domain information alone is not adequate for effective NDE. Among all the t-f analysis methods, both Wigner distributions(WD) and WT are the most recent techniques for processing signals with time-varing spectra. [2,3] WD and WT have been considered for use in UNDE. However, the full potential of the t-f analysis in UNDE is yet to be explored. There have been intense research activity in the application of wavelet transforms in various fields of science and engineering. INOUE et al[5,6] applied the determination of ultrasonic velocity and attenuation by wavelet analysis of echo waveform. In this paper, the WT theory using the Gabor wavelet is briefly introduced and its application to UNDE is explained. It will be shown that the arrival times of group velocity at each frequency by using the peak of the magnitude of the WT can be extracted. NDE for degraded structural materials used at high temperature by surface SH-wave method which is horizontally polarized shear wave traveling along near surface and subsurface layer is discussed. Two examples of experimental wavelet analysis and applications to UNDE were presented. First, 0.25Cr-1Mo steel used at high temperatures was evaluated by UNDE techniques. wavelet transform is applied to time-frequency analysis of ultrasonic echo waveform obtained by surface SH-wave technique. The Gabor function is adopted the analyzing wavelet. Using the WT, material degradation is to be evaluated through observation of the relation between micro-structural variation of the simulated degradation and surface SH-wave propagation characteristics such as velocity, attenuation coefficient and amplitude spectra etc. In addition, it has verified experimentally the frequency-dependence of ultrasonic group velocity and attenuation coefficient using wavelet analysis. In the second example, we consider the feasibility of the enhancement of the flaw detection performance(probability of detection; POD, false call probability;FCP) and noise suppression of ultrasonic flaw signal using the WT has been verified experimentally, which results in the enhancement of S/N ratio and the effectiveness of the noise suppression of ultrasonic flaw signal obtained from austenitic stainless steel weld including EDM notch. where wo and g are positive constants. In this study, we set according to Morlet. If eq (6) is substituted into eq (2), it is understood that the WT using the Gabor wavelet has a similar form to the Fourier transform with Gaussian windowing. Hence we set wo = 2 p such that 1/a takes the same value as the frequency w0/(2 p). where k1 and k2 are wave numbers. Test material is 2.25Cr-1Mo steel which is used as a material of turbine rotor of high-temperature and high-pressure power plant. The chemical composition(in wt%) of the material used is given in Table 1. Table 2 shows the accelerated aging time at 650°C for equivalent microstructure served at 538°C. This is to simulate the microstructures of long term served materials at elevated temperature because of difficulty to sample the aged materials on site. All specimens were given homogenous treatment to obtain uniform substructure. Surface roughness of the specimens were maintained within 1m m rms. All the specimen surfaces were given a common surface finish to avoid possible error due to variation in surface finish. Metallographical characterization involved hardness determination, optical microscopy. Fig. 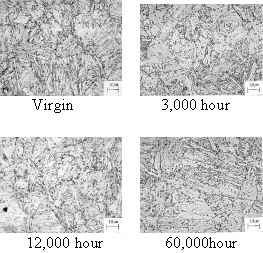 1 is the representative optical microscopy of the virgin and degraded reference specimens. Optical microscopy of virgin sample shows the tempered martensite structure. Otherwise, the case of degraded samples show the precipitates of carbons along the grain boundaries. Composition 0.024 2.15 0.64 Bal. A schematic of the experimental setup is shown in Fig. 2. A couple of 5 MHz commercial type contact surface SH wave transducers supplied by Japan Probe Co., along with a ultrasonic flaw detector(UDS 15;krautkramer Co.) is used to generate and receive the ultrasonic signals. SHN-40(Nichigou Acetylene Co., Ltd) was used as the couplant for shear wave exclusive use. The analog signal was digitized using a Lecroy 9374M digital storage oscilloscope(DSO) with a sampling rate of 1GHz. The numerical simulations were performed using the pentium computer and MATLAB software routines. For each specimen, several measurements were made and the average amplitude was used for the calibration. Care was taken to repeat the same coupling condition during each measurement. domain information. The propagation time is measured by pitch-catch method with two surface SH-wave probes. As the degradation time is increasing, ultrasonic propagation time is also an apparent increasing. A typical ultrasonic waveform is shown in Fig. 3. Fig. 3 shows the time-frequency distribution of the magnitude of the WT and its contour plot. The absolute value of the WT is plotted in logarithmic scale in Fig. 3(c) as a function of time-shift coefficient and the dilation coefficient. Contour plot of th WT in Fig. 3(b) represents the time-scale representation of the signal in Fig. 3(a). Scale is an attribute of a signal and is inversely proportional to the frequency of the signal. Ultrasonic attenuation and group velocity dependent on frequency are accurately measured using the WT. Fig. 5 shows the frequency dependence of attenuation coefficient identified by the WT analysis. Using the time frequency distribution of the magnitude of the WT, analysis of dependency on frequency of group velocity and attenuation can be evaluated. In this experiment, as degradation time increases, attenuation coefficient increases. In the case of this specimen, group velocity isn't greatly dependent on frequency but, in attenuation coefficient, degraded material manifests itself strong dependent on frequency compared with virgin material as shown in Figure 5. It is considered that variation in grain size has a great influence on ultrasonic attenuation as quantity of degradation time increases. Pulse echo reflection techniques are used for ultrasonic flaw detection in most commercial instruments. The ultrasonic wave, generated by a piezoelectric transducer coupled to the test specimen, propagates through the material and part of its energy is reflected if the wave encounters an inhomogeneity or discontinuity in its path, while the remainder is reflected by the back surface of the sample. There have been several investigations into additive noise suppression in signals and images using wavelet transforms[14,15]. De-noising of signals is extremely important in ultrasonic flaw detection, as to correctly identify smaller defects. If the amplitude of the signal from the defect is below the detection threshold, the defect will not be reported. The probability of detection(POD) usually decrease as the defect size decreases, while the probability of false call(PFC) does increase. It is obvious that the threshold level should be set above the noise level and below the signal level, and processing of the signals does increase the POD, without altering or increasing the PFC. For automated inspection systems, it is recommended to set the threshold level about 1.6-2.0 times the mean noise level. This means that the defect signal-to-noise ratio has to be higher than 4.0-6.0 dB. The WT can be used to suppress noise of ultrasonic flaw signals and to enhance flaw detectability. Fig. 6 shows the results of de-noising of ultrasonic flaw signal using the WT obtained from austenite stainless steel weld including EDM notch. The maximum ultrasonic flaw signal is acquired through near side access. A commercial 5MHz angle beam transducer is used. Experimental results shows that the WT is capable of flaw echo detection for UNDE application in low signal-to-noise ratio. Recently, advanced signal analysis which is called "time-frequency analysis" has been used widely in nondestructive evaluation(NDE) applications. The wavelet transform(WT) is applied to the time-frequency analysis of ultrasonic echo waveform obtained by an ultrasonic pulse-echo technique. The Gabor function is adopted the analyzing wavelet. In this study, the feasibility of noise suppression of ultrasonic flaw signal and NDE of material degradation using wavelet analysis of ultrasonic echo waveform have been verified experimentally. Experimental results shows that material degradation can be evaluated through observation of the relation between micro-structural variation of the simulated degradation and surface SH-wave propagation characteristics such as velocity, attenuation coefficient. In addition, it has verified experimentally the frequency-dependence of ultrasonic group velocity and attenuation coefficient using the WT. H. Inoue et al "Determination of ultrasonic velocity and attenuation by avelet analysis of echo waveform", J. of JSNDI, Vol. 46, No. 3, pp 206-213, 1997. Sato, M.,"Mathematical foundation of wavelets", J. of Accoust. Soc. Japan, 47(6), pp 405-423, 1991.